No wardrobe is complete without a classic white shirt. A white shirt indisputably is a fashion staple & one of the most versatile pieces a man can own. You can style a white shirt in many different ways; here are some smart ideas that will enable you to pull off your white shirt with élan. Liven it with Bold Prints- Breathe color and life into your white shirt by pairing it with a bold pattern or printed pants. Check pants are a fashion statement these winters, so style your favorite white shirt with a nicely fitted check pants and work your way to the latest trend. Add some Layers- In winters, white shirts are good for layering. You can wear it under any bright colored jumper or team it with a blazer in any dark color like black, blue, tan and grey, these are perfect color choice for winters and can never go wrong. Pair with Denim- White shirts and denim is one of the best combinations. For a cool and comfy look wear your favorite white shirt with a nicely fitted pair of denims. This winters flared denim jeans are back, so flaunt your style with denim. Smarten up with a jacket- Pep up your style quotient by pairing your white shirt with a tailored jacket during warmer days. A dress jacket in any attention-grabbing color like bright blue or forest green or pastels during the warmer months makes a perfect combination. You can also go for a colorful hoodie to give your wardrobe a cool-casual look. Lastly, nothing clashes with a white shirt; you can button up your white shirt to the collar for a formal look or undone the first two buttons for a trendy & casual look, tuck it in or let it be lose or go for half & half depending upon your personal style. 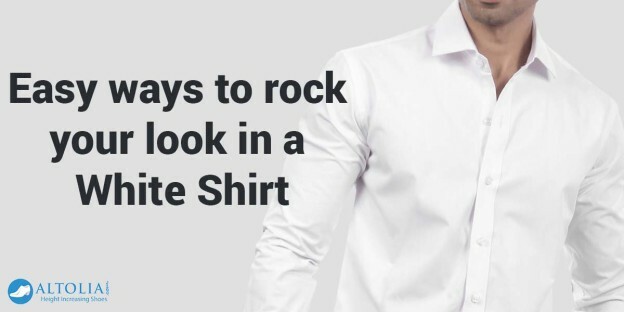 Whatever way you choose to wear it, just remember nothing can beat a well fitted classic white shirt.